Days after being inducted into the Rock and Roll Hall of Fame, members of the legendary progressive rock enclave Yes have announced a date at the Seneca Niagara Casino. The Marriott Niagara Falls Fallsview Hotel has earned Hall of Fame honours from travel review site TripAdvisor. The Marriott recently earned the site’s Certificate of Excellence for the fifth year in a row, which qualified it for the lofty status. Last week I received the latest email newsletter from Bird Kingdom. The popular 60’s rock band The Beach Boys kick off April’s concert line-up at Fallsview Casino Resort. The group, which hails from California, was formed 50 years ago and became a member of the Rock and Roll Hall of Fame in 1988. The Beach Boys bring their timeless classics to the Avalon stage, including “Good Vibrations”, “California Girls” and “Surfin’ U.S.A.” for two shows on April 7 and 8. 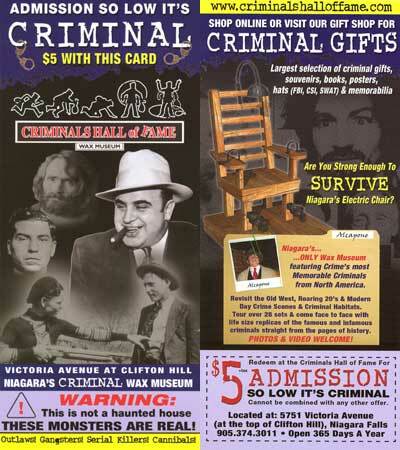 A few weeks ago I had the opportunity to go to the Criminals Hall of Fame on Victoria Ave at the top of Clifton Hill. I have been there before, but it has been many years since that visit, so I was looking forward to going again. The wax museum has been in the area for a long time, but doesn’t seem to get much publicity. The only recent publicity has been a result of their admission price. For a couple of years now, they have been charging $5 or $6. It seems to have settled at $5 (although they could, of course, change it at any time). For the price, you can’t really beat it. The museum was much larger than I expected. After you have paid, you head off to the left and are greeted by a large wax figure of Hitler. The other wax figures you will see along the way are of similarly despicable people. There are sets showing wild west bandits, gangsters, and more “modern” killers. Each set has a sign explaining who is in the set and what crimes they committed. The wax figures themselves mostly looked fine, but since I don’t really know what the people looked like, all I could look at was whether they looked like people or not. That actually might be one of the best things about the Criminals Hall of Fame. When I go to Tussaud’s or Movieland, I know what the people look like, so I end up focusing too much on little things about the figure. I guess when you see certain stars so often, you end up knowing a lot about them. On the other hand, since I wasn’t familiar with the looks of most of the criminals, I wasn’t distracted by those little things. The lighting in the museum is very poor. This may be intentional (it adds to the criminal theme? ), but it was a little uncomfortable around. The other drawback of the museum is that all of the sets are behind Plexiglas, which makes it difficult to take pictures. As I said above, it’s worth the price. I did manage to take a few pictures without too much glare. As always, you can see some of the thumbnails below, and you can see all of them along with the larger versions in the Criminals Hall of Fame in Summer 2010 gallery. As a side note, there are now 3,151 images in 250 galleries in the Niagara Falls Image Gallery. The Stanley Cup is coming to Niagara Falls. The Hockey Hall of Fame put together a package specifically for the 27th year of the Niagara Falls Winter Festival of Lights at the Rink on the Brink on Saturday, Dec. 19 for families to attend. Rink on the Brink is an outdoor skating rink (18-by-36 metres) located next to the Table Rock on the Niagara Parkway right across from the Falls. “We’re trying to encourage all of the youth in local sports, boys or girls, whether it’s travel or house league, or even sports enthusiasts to come down and participate in leisure skating, enjoy the memorabilia and get your photograph taken with the Cup,” said Rick Morocco, the manager of sponsorship and sales of WFOL.